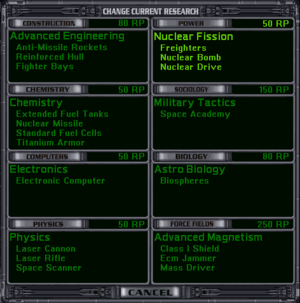 The Physics techs appear in the bottom left box in the Research Menu and are responsible for acquiring most of the beam weapons in the game. Getting the best weapon isn't always the best solution. Take Fusion Beam rather than Fusion Rifle, which means your Marines have to make do with the unimpressive Laser Rifle for a long time. In the first Force Fields tech level, take Mass Driver as your first decent "beam" weapons. You forgo ECM Jammer, and and have to hope either that no opponent ever uses torpedoes or that you get one of the much later jamming techs before enemy torpedoes cause you heavy losses. The Physics and Force Fields tech tree between them force non-Creatives to make some really difficult choices. The problem is that Force Fields tech tree have in some case better weapons, but if you take it you become vulnerable for some kind of attack: beam (with fighters) or missles (with torpedos and bombers). Thus the best choice at low level of Physics is to take decent weapons until you reach Plasma Cannon in the upper half of this tech tree. Reduce damage by shields (take Class I Shield and thus miss out on Mass Driver) or Damper Field. Destroy by beams, Anti-Missile Rockets, other fighters, Lightning Field, explode or some other special gear. Displace on battle screen and run out from combat before it reaches you. Become totally invisible in combat. Kill before you get killed - play offensively. None. You have to research all the Physics techs if the game starts at Pre-Warp. Ship beam weapon that does 1-4 damage, minus whatever is blocked by the target's shields. Not useful until you get all of the modifications; even then Class 3 Shields generally make them ineffective. PD Lasers are particulary ineffective. Modifications: (0) HV, PD; (1) AP, CO, NR; (2) AF. This large set of modifications is mainly for the benefit of Uncreatives, who might not get a better "beam" weapon for a very long time. Achievement that increases ground units' effectiveness by +5%. Not cumulative with other rifles. Achievement that extends warships' and Star Bases' ability to detect enemy ships. The maximum detection range depends on the enemy ships' size and is 1 parsec + 1 per size class, so it ranges from 2 parsecs for Frigates to 5 for Battleships (and 6 for Titans, 7 for Doom Stars if you don't get better scanners before someone builds these larger ships). The upgrade is immediate and free. Ship beam weapon that does 2-6 damage, minus whatever is blocked by the target's shields. The lowest-tech beam weapon that's useful, especially with all the modifications; but it has twice the normal rate of dissipation, i.e. reduction in power per combat square between the weapon and its target - that's one reason why Augmented Engines are usually the best choice at the 3rd level of the Power tech tree. Even so, Class 3 Shields generally make them ineffective. In terms of ability to do damage fully-modified PD Fusion Beams are the most powerful PD weapons until Phasors (below); but their twice-the-normal dissipation has the tactical disadvantage that it's difficult for one ship to help defend another that's attacked by a swarm of missiles or fighters. Modifications: (0) HV, PD; (1) CO; (2) ENV. Achievement that increases ground units' effectiveness by +10%. Not cumulative with other rifles. The best rifle you'll get for a long time. Best choice for non-Creatives: Fusion Beam, for the reasons given above and despite the fact that you won't get a better rifle before you want to start invading. Achievement that allows you to tell a ship within 3 parsecs of a colony or outpost to change course in mid-transit, and adds 1 Command Point for each Star Base, Battlestation, and Star Fortress. Not cumulative with any other communications Achievement. Achievement that extends warships' and Star Bases' ability to detect enemy ships to 3 parsecs + 1 per size class, so it ranges from 4 parsecs for Frigates to 7 for Battleships (and 8 for Titans, 9 for Doom Stars if you don't get better scanners before someone builds these larger ships). Your Star Bases, Battlestations and Star Fortresses also decrease aggressors' Missile Evasion by -20%. The upgrade is immediate and free. Ship Special System that increases "beam" weapons' chance to hit by +50%, and increases scanning range outside of combat (on the Galaxy map) by 2 parsecs. Best choice for non-Creatives: Battle Scanner is essential if you intend to use "beam" weapons. Otherwise probably Tachyon Communications, as the next communications tech is 3 levels up. Ship Weapon that does 3-12 damage, minus whatever is blocked by the target's shields; and also kills 1 enemy Marine for every 5 points of damage that penetrate the shields. Neutron Blasters don't have AF or ENV modifications and as a result are less effective in destroying enemy ships than other weapons, however their ability to kill marines can help you defend against enemy boarding ships or make it easier for your own boarding ships. Modifications: (0) HV but not PD; (1) CO.
Achievement that extends warships' and Star Bases' ability to detect enemy ships to 5 parsecs + 1 per size class, so it ranges from 6 parsecs for Frigates to 9 for Battleships (and 10 for Titans, 11 for Doom Stars if you don't get better scanners before someone builds these larger ships). Your Star Bases, Battlestations and Star Fortresses also decrease aggressors' Missile Evasion by -40%. The upgrade is immediate and free. Best choice for non-Creatives: Neutron Scanner if you use missiles. Otherwise Neutron Blaster. It is almost as effective against heavy-armored ships and stations as Phasors and Gauss Cannons. Do not destroy the target, use Neutron Blaster to capture it. Ship Special Weapon that greatly reduces the target's combat speed, and can even immobilize enemy ships. When a ship is immobilized, they are very easy to hit and they can be boarded directly. It takes four Tractor Beams to immobilize a Battleship (one per size class) and the effects are cumulative from multiple ships. This is a must have if you want good "ground combat" techs and skills. Set 2 of it on every battle ship and board every enemy ship! Every fight can double the power of your's fleet! You even can try to get Antarian's ship! Stasis Field makes it almost guaranteed (50% chance from Quantum Detonator). Ship beam weapon that does 3-15 damage, minus whatever is blocked by the target's shields; in addition the target's structure is damaged, even if its armor is still functional, provided the shields are penetrated; when both shields and armor are gone enemy ships evaporate quickly, since now both the normal and "bonus" damage are done to the structure. A good weapon whose main limitation is shortage of modifications. Building that eliminates gravity penalties on planets whose gravity is outside the colonist's comfort zone. Best choice for non-Creatives: Tractor Beam for special tactics. Otherwise Gravity Generator, unless your race is High-G (the penalties for lower gravity are half those for higher gravity than your race is accustomed to) - but even then Gravity Generator would be a good choice, since you will almost certainly conquer some High-G planets inhabited by Normal-G or Low-G races. Of course, if you let those populations live you could have a variety to use in different situations. Achievement that allows you to tell a ship within 6 parsecs of a colony or outpost to change course in mid-transit, and adds 2 Command Poinst for each Star Base, Battlestation, and Star Fortress. Not cumulative with any other communications Achievement. Achievement that increases rate of ship travel between your colonies by 3 parsecs per turn. Best choice for non-Creatives: Subspace Communications, as non-Creatives usually forgo Tachyon Communications in order to get Battle Scanner. Ship beam weapon that does 5-20 damage, minus whatever is blocked by the target's shields. It's the only researchable weapon that allows the Shield Piercing modification, which makes normal Phasors significantly more effective than Heavy Mount versions(which are normally used in order to overcome the damage block of shields and early game attack range problems) and coupled with High Energy Focus they can completely devastate ships that don't have Hard Shields. Phasors are also the most powerful PD weapons you can research, but until you miniaturize them enough to use their AF modification, it's best to keep using PD AF Mass Drivers or PD CO ENV Fusion beams. Modifications: (0) HV, PD; (1) CO, SP; (2) AF. Achievement that increases ground units' effectiveness by +20%. Not cumulative with other rifles. Ship Special System that increases the damage shields can absorb by 50% of their maximum strength. Best choice for non-Creatives: Phasors, for the SP and PD capabilities. Phasor Rifle becomes obsolete after just one more level of research and the effect of Multi-Phased Shields is not very significant. Ship beam weapon that does 6-30 damage and drops shield, minus whatever is blocked by the target's shields; and it's naturally enveloping, so when the shields are down it does quadruple damage. Average is 18x4=72 with 25 cost space. It's almost as good as legendary Death Ray 100 with 30 cost space. Its worst limitation is its twice-the-normal dissipation per combat square between it and the target; but this can be reduced by good combat mobility, which is available very early with Augmented Engines. It's brutally effective against targets with weak or no shields, including Antarans. Modifications: (0) HV but not PD; (1) CO; (there are no level 2 modifications; it's naturally enveloping). Achievement that increases ground troop combat rating by 30%, the best rifle in the game. Not cumulative with other rifles. Ship Special Weapon that is naturally enveloping and does 5-25 damage per turn, decreasing at a rate of -5 per turn. A very dangerous weapon, but that makes ships that use it priority targets; the best counter to it is to retreat "webbed" ships during combat. That means it's best used with Warp Dissipator. Due to it's stacking nature and the way it deals damage the weapon is an excellent counter to ships with automated repair systems, strong shields and/or shield boosting systems. Modifications: none (it's naturally enveloping). Best choice for non-Creatives: Plasma Rifle, because it's the best rifle that can be researched. If you are going to take Antarans: Plasma Web. Ship beam weapon that does 40 damage, minus whatever is blocked by the target's shields, and with no range dissipation. It's pretty bulky, so Phasors provide a lot more damage per unit of space, until you max out it's miniaturization or face Class X Shields + Hard Shields. It's more expensive than most weapons, so a battleship armed with Disruptors costs about 7% more than one with equally advanced alternative weapons. Modifications: (0) HV but not PD; (1) none; (2) AF. Orbital building that enables you to launch an attack on the Antarans from the system in which the Portal was built. You can only research this if you selected "Antarans Attack" during game start-up. Best choice for non-Creatives: Dimensional Portal is essential if you want to attack Antarans (often forbidden in multi-player games). Otherwise you're left with the Disruptor Cannon. Achievement that allows you to tell a ship anywhere on the Galaxy map to change course in mid-transit, and adds 3 Command Points for each Star Base, Battlestation and Star Fortress. Not cumulative with any other communication techs. The upgrade is immediate and free. Ship beam weapon that does 100 damage, minus whatever is blocked by the target's shields, but with double the usual range dissipation; this limitation can be reduced by good combat mobility, which is available very early with Augmented Engines. Does not miss unless the target has a Displacement Device, so is useful for players with poor computers. Very bulky initially. Achievement that extends warships' and colonies' ability to detect enemy ships to 8 parsecs + 1 per size class, so it ranges from 9 parsecs for Frigates to 12 for Battleships (and 13 for Titans, 14 for Doom Stars). Also Sensors reduce enemy ships' missile evasion by 70%. The upgrade is immediate and free. Best choice for non-Creatives: Depends on the situation. The mauler device is a decent "beam" that normally does not miss, so it can give you good, guaranteed punch even if your computers are primitive and it can benefit from techs that improve beams such as Hyper X Capacitors. However, its size means it compares poorly to the plasma cannon, which has the continuous modification to help it hit even with bad computers. Of course, if you took the plasma rifle instead, the mauler device can be a good pick. It is a good way to switch away from missiles/torps if your opponents have started using lots of point defense (or anti-missile/torp techs like the lightning field or ECM) and your missiles/torps are becoming less effective. Sensors are good if you are missile or torpedo focused and plan on staying that way. Hyperspace communications can give you some good strategic flexibility, as you can control any ship no matter where it is. If you've already got good beams, decent computers, and don't use missiles/torps that much, it can be surprisingly useful. Ship Special System that enables the ship to move and fire twice per combat turn; the 2nd "mini-turn" is after all enemy ships and bases have fired. Very bulky initially. This is both a ship-based and ground-based weapon. Both versions are terrifying: they do 400 damage (what shields? ); are naturally enveloping, i.e. do quadruple the stated damage; have no range dissipation and unlimited range; and they do not miss (the Displacement Device does not affect the stellar converter); and the ship-based version completely destroys a planet when used for orbital bombardment, turning it into an Asteroid Belt. The ground-based weapon is even more horrific if protected by good armor and a good planetary shield (Flux Shield or Barrier Shield). But it's not invincible: a pair of extremely good Titans can beat the ground based version, usually without losing one, even if the Stellar Converter is maximally hardened and is the last of 4 ground-based defenses to fall - but only if the attackers are the Warships From Hell, with the right techs from Orion and the full Creative firepower enhancement kit. Of course a larger fleet of smaller ships can do the job, if you have enough Command Points and enough industrial capacity to replace your very heavy losses quickly before taking on your opponent's next Stellar Converter; the "many small ships" approach exploits that fact that the Stellar Converter's enormous power is largely wasted on small ships. Achievement that enables all your ship to move from any colony to any other in 1 turn, regardless of drives and distance. If an enemy with Star Gates gains a colony in one of your systems, either by conquest or by colonization, you will lose that system because the opponent's entire fleet can magically appear there at any time. Best choice for non-Creatives: Depends on the situation. If you are on the offense, the time warp facilitator is the best choice. If you are defending, get the stellar converter or the star gate. Do your utmost to finish the game before any Creative players get all 3! The late-game high-tech beam weapons are all in the Physics tech tree, so at least 2 Hyper-Advanced Physics levels will be useful in miniaturizing your weapons. 5 levels of Hyper-Advanced miniaturization enables a Creative player to build a Doom Star with a Time Warp Facilitator, 4 Stellar Converters, a lot of fly-swatters and a Subspace Teleporter (device instantly moves the ship to anywhere on the combat map, in this case to the far edge so it's out of range of most defenders before it starts demolition) and the usual firepower enhancers - this ship is not invincible, but that's another story! This page was last edited on 20 December 2018, at 21:17. This page has been accessed 62,356 times.